The iPad Pro is better but that doesn’t mean it can’t pick up a few pointers. Like the iPad Pro, the Pixel Slate’s only connection is USB-C (there’s no headphone jack), but Google does Apple one better by adding a second port on the opposite side. So, no matter which side your outlet is on, you’ll be able to plug in without wrapping the wire around the screen. Google also positions the ports on the bottom rather than the center of the edge, so it looks much nicer when plugged in. The Pixel Slate’s unassuming logo is landscape-oriented, unlike the iPad Pro’s portrait one. This one is a head-scratcher. Apple allows you to connect cameras and displays using the iPad Pro’s USB-C port, but when you plug in a hard drive, nothing happens. That’s just unacceptable for a pro machine. With the Slate, pretty much every USB-C PC drive works right out of the box, and you can access what’s on it directly in the Files app. For now, the USB-C port on the iPad is really just a tease. This has been a bone of contention for a while, but it’s only exasperated by the high price of the iPad Pro. Apple doesn’t expect every member of a household to buy their own Mac, so why should they have to spend $800 or $1,000 on their own iPad? Google’s multi-user support on the Pixel Slate isn’t perfect—most notably, only the main user has support for the Play Store and Android apps—but at least you don’t have to buy separate Slates for every member of the family. The Pixel Slate keyboard has backlighting and a trackpad, making the Smart Keyboard Folio seem less smart. 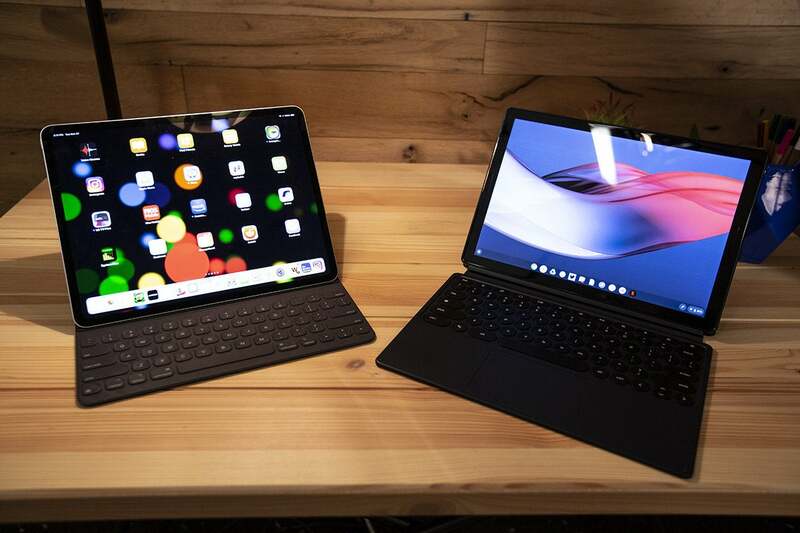 With such large screens, both the iPad Pro and Pixel Slate are most at home when attached to a keyboard. But with the Pixel Slate Keyboard you get two things that are sorely missing on Apple’s Smart Keyboard Folio: backlighting and a trackpad. Apple was one of the first companies to offer backlit keys on a PC, so the lack of it on the iPad Pro’s keyboard is a severe step backwards. And I know iOS doesn’t technically support a cursor, but Apple could design something elegant for the iPad Pro to let you control things on the screen while still keeping your hands on the keyboard. Reaching back and forth is just no fun. This is the big one, and the main difference between the Pixel Slate and the iPad Pro. 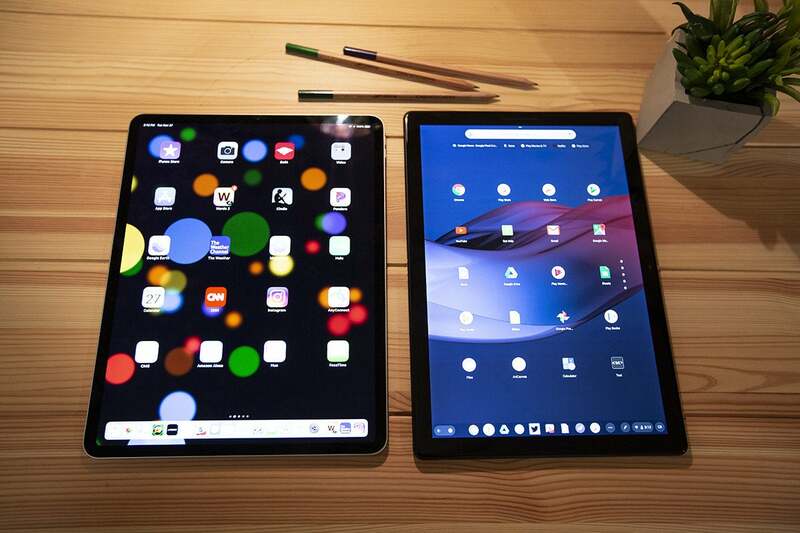 Both devices have full-featured browsers that deliver fast, dynamic web content, but with the iPad you’re still technically using a mobile browser. Chrome on the Pixel Slate is the same as Chrome on a PC, and the difference is huge, with the ability to run native web apps, rich browser extensions, and most importantly, no need to request the desktop version of sites over and over again. If Apple truly wants the iPad Pro to be someone’s main computer, it needs a desktop version of Safari. 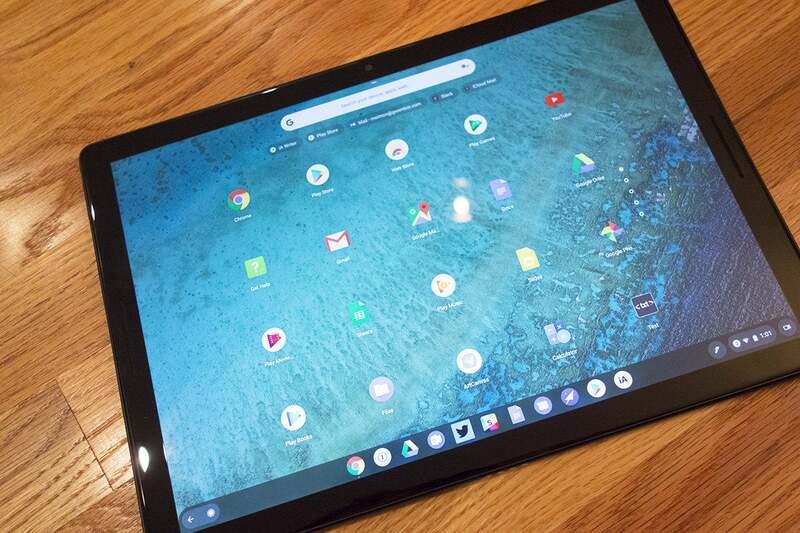 Since the Pixel Slate is a tablet, Google has redesigned the traditional Chrome OS interface to better suit touch. On its own, it’s a nice UI, if not a little iOS-like, with full-screen and split-screen apps, a dock, and drawer with app icons instead of a home screen. But when you pop the Slate into a keyboard, the old Chrome interface returns, with PC-like multitasking and an on-screen back button. The only problem is, there isn’t a great synergy between them, which only highlights the flaws of each one. If Apple is redesigning iOS for the iPad as it has been rumored to be doing, we need one interface that’s versatile enough to handle touch-based and keyboard-based interactions seamlessly. When unattached from a keyboard, the Pixel Slate’s interface is very iOS like. Like the Pixel 3, the Pixel Slate has front-firing stereo speaker, which sound great and seem great on paper. But in practice, those grilles are dust and dirt magnets and very quickly make your device look older than it is. I’ll take the iPad’s semi-hidden edge-firing speakers any day. The Pixel Slate starts at $599 and goes all the way up to $1,599, depending on the processor, storage, and RAM you choose. That’s just plain confusing for customers, with a little dose of FOMO mixed in. 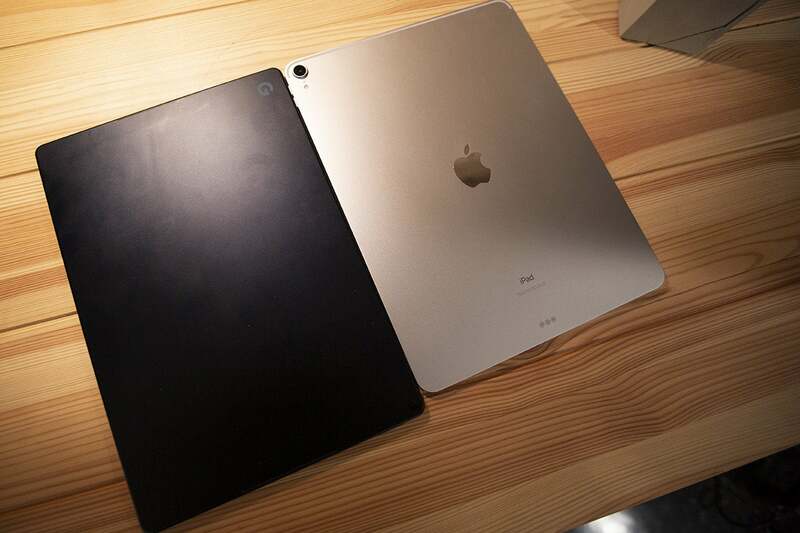 While some people would love to configure their iPad with extra RAM or an A13 processor, it’s best that Apple keeps the options simple, though we wouldn’t be opposed to a few XR-style color options.